Fair trade falls short when the relationships along the chain are reduced to simple “trading partnerships.” Trade is the vehicle for the relationship, but the road it travels should lead to the foundation of real global communities, through which people connected by economic exchange can see each other and interact. This is the transformative piece of the ideal. True fair trade is often buried beneath “certifications” that do more for the marketing of coffee in the Global North than for the actual well-being of the farmer in the Global South. If we want to build an authentic model of fair trade that stands up to its name, we must work directly with small farmers and transform the term from a marketing device to a real movement based on building economic democracy. Certifications alone do not accomplish this and, at times, can actually “dumb down” the real work that we need to do in our companies and in our communities. We started our respective businesses as experiments in building this type of exchange. In January of 2013, we went to Southern Mexico and Central America to see what a decade of fair trade has done for the farmer cooperatives we work with and the families that comprise them. In those travels through Mexico, Guatemala, El Salvador and Nicaragua, we met with our partners and listened to their thoughts and stories, which sometimes inspired us and at other times broke our hearts. Through conversations, it became even more clear that the term “fair trade” does not have a unified meaning. There are some potentially good things that can come from big corporations following minimum fair trade standards – including short-term benefits for farmers. But what we increasingly found is that the small-scale farmers we work with are not satisfied with the results of “certified fair trade,” and they are investing in building a more authentic model that truly is better for all involved. In order to participate in an authentic fair trade, we need to hang our hats on our relationships and not simply on the prices we pay. 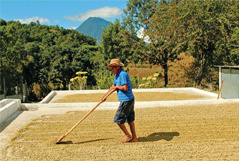 Nearly 75% of the world’s coffee growers are small-scale farmers working less than five acres of land. Many of these farmers and their families make up the one-sixth of the world’s population without access to potable water. Additionally, health care, education, food security and other human rights are not always a given. The cash from coffee sales – even at fair trade minimum prices – is not enough to cover all the needs in their households and communities. In a better model, we connect and dedicate some of our own resources beyond that sale to helping farmers get to where they want to be. Our conversations with coffee farmers reinforced the notion that “consumer” and “producer” are just two of the many roles we claim as members of a global community. We connect with the people who grow our coffee when we engage in the economic transaction of purchasing it, but we should also use that connection to find more ways to creatively support and work with the coffee farming communities. We began working with the Chiapas, Mexico cooperative Maya Vinic in 2002, some four years after the Acteal Massacre galvanized the formation of the group. This was the beginning of a great friendship, and we continue to visit Chiapas at least once a year. On our most recent visit, we were able to see old friends and talk about how things were going in general. There have been some successes in the past year with Maya Vinic’s new cafe in San Cristobal and with a swell of members joining the cooperative. Despite small successes, the lives of these farmers remain difficult. In the village of Aurora Esquipulas, we slept in the house of a farmer named Gerardo. He told us that he would not make enough this year to pay for his production – or for unexpected costs like a trip to the clinic, new shoes for his kids or a home repair. He had hoped to replace his dirt floor with concrete this year, but now he must put that project off until 2014. While there, we attended the christening of a water line, water tanks and washing station in the hamlet, the results of a project run by a local NGO that our companies and customers contributed to through our affiliated non-profit organizations. The takeaway for us was a clear sentiment that buying and selling coffee from small-scale farmers is not enough, and that we can do more. Fair trade premiums are received by the cooperative, but they are not enough to fund many of the needed projects in coffee communities. In Guatemala, we visited with the Comite Campesino del Altiplano (CCDA), just off the shores of the volcano-rimmed Lake Atitlan. Formed in 1982 during the civil war, CCDA emerged as a civilian support group dedicating itself to campesino and indigenous rights. Today it represents over 1,800 coffee farmers and many more campesinos who are involved in the larger political organization. CCDA President Leocadio Juracan told us, “The majority of coffee farmers are just producing the raw materials for large multinationals.” He respectfully asked how letting multinationals take the wheel of fair trade – like we have seen with FTUSA’s “Fair Trade for All” – can be fair in any way. Leo stressed the importance of building “solidarity trade networks,” which CCDA calls “fair trade plus,” between people, communities and organizations with similar political goals, as opposed to working with the multinationals who have traditionally exploited small farmers. He pointed to the plantation next to the community and drew a clear connection to the historically exploited farmworkers who work under harsh conditions for little money. 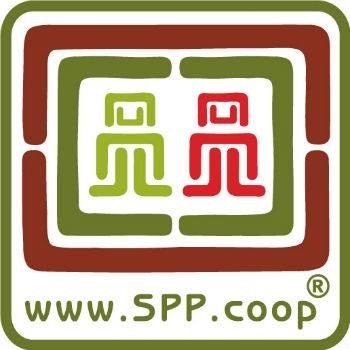 Working toward a better model, CCDA is our first partner to join the new Small Producer Symbol (SPP) certification that is owned and operated by small-scale farmers. This seal is a great opportunity to build a better fair trade system with real farmer control and help ensure that farmers can stay on their lands and out of the plantation fields. In El Salvador, we visited Las Marias 93. 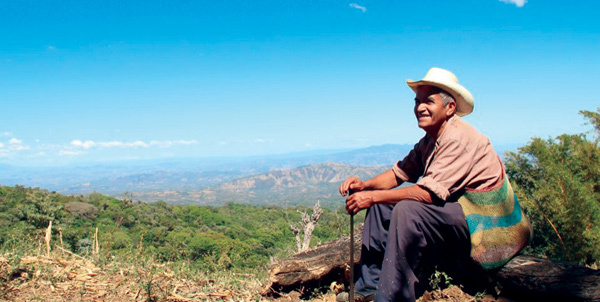 The farmers of Las Marias were once members of the FMLN rebel army. In 1993, they put down their arms and picked up machetes to farm land that they received through the peace accords. Now they make a living on the slopes of the same mountain where they fought. After years of fighting for their land, they now face a new enemy. This year, 40% of Las Marias’ harvest has been ruined by a fungus called Roya (or coffee rust). Heavy rain and an inability for plants to dry – a real result of climate change – is creating this epidemic, devastating crops in Southern Mexico, Central America and elsewhere. Coffee farmers all over the world need serious help to recover from this still-unfolding crisis; their livelihoods are in danger, and their coffee plants are dying. The free market’s response will not be kind. Despite the fair trade ethos of building long-term partnerships with farmers, the response from roasters and importers using “the seal” has for the most part been slow. The stakes for building a better model of fair trade have never been higher, as farmers continue to struggle. Compromised fair trade certifiers and multinational corporations will not create real change – they will actually prevent it. Instead of simply trusting certifications, we should use our own resources to take the next steps in building a movement that truly uses trade as one tool for creating a better world. But without direct engagement from companies and coffee drinkers collectively building an authentic fair trade, we cannot accomplish this. Beyond purchasing items from dedicated companies and producer groups, you can get more involved by contacting your local mission-based fair trade organization to see how you can plug in. We started the non-profit organizations On The Ground (www.onthegroundglobal.org) and Outside the Bean (www.outsidethebean.org) to address some of the needs we have seen. You can look for like-minded organizations or resources in your community to dig deeper, or consider starting an initiative yourself. Though we may not always realize it, we are intimately connected to the people who produce the things that clothe us, feed us and generally make our lives better. In return, we can use the vehicle of trade as a way to break down barriers and to truly see our partners on the other end of the road traveled by these products. Without that dynamic, how can we claim that the trade we do is fair?